5th Annual Sturgis FXR And Dyna Show Is Sunday August 6th. Published by Cyril Huze July 8th, 2017	in Events. 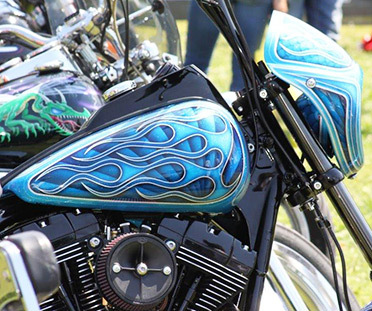 Last year The FXR Show had over 100 FXR’s and 30 Dyna’s registered to enter this bike show. Quite possibly the largest single motorcycle show of the 2016 Sturgis Rally. The 2017 Sturgis Rally will mark the 5th Annual Sturgis FXR Show. The first three years of the show were held in historic Sturgis City Park and the fourth at the Sturgis Dragway. This year, the 2017 FXR Show will be held at the Legendary Buffalo Chip at the Crossroads venue. The show format will be much the same as it has been for the first four years. However as last year Harley Dyna motorcycles will be added to the event. The show organizers give out awards for the Top 10 of the show based on popular vote as voted on by the show entrants. There is a people’s choice award as well so everyone can be involved. The FXR Show 1st Place Best of Show is also crowned. All the awards consist of quality motorcycle parts and merchandise donated my many of the motorcycle industries best companies. The show will be held on Sunday August 6th at the Crossroads located at the Buffalo Chip. Registration for the show will start around 9:30 AM and the show will officially start at 11 AM. The show will end with the award presentation at 2 PM and finished by 3 PM. More details and information will be forth coming at FXR Show. p.s. I ride FXR, so of course they are the best!! Because the organizer must be afraid not to have enough FXR,s in his show…. I chose to include the DYNA crowd last year because they are obviously part of the same custom trend that has brought the FXR platform back to its former glory. Not that the FXR ever really lost its glory. WeI’ve had 100+ FXRs in the show the last two years. So I’m not worried about enough FXRs coming to the show. It’s a bike show about sharing your ride, meeting like minded riders and raising money for a good cause. It’s just about having some fun with other motorcyclists, period.